When my husband and I exchange birthday or Christmas presents it’s not unusual for the gift giver to buy an item they personally want but then to claim it was chosen as ‘something we’ll enjoy together’. I think this was the case with the cookbook Rick Stein’s India. Despite me being vocal about ‘no more cookbooks’ my husband bought me this for my birthday, insisting that he was blown away by the authenticity of the recipes. A month or so later it turns out he was right (despite his own motivations for wanting the book). Rick Stein really got into the heart of Indian cooking as he travelled through what I’ve experienced as a colourful, humbling and chaotic country. He opens with a lovely sentiment of “when Indians talk of food, they talk about their life”…. Anyway onto this recipe. 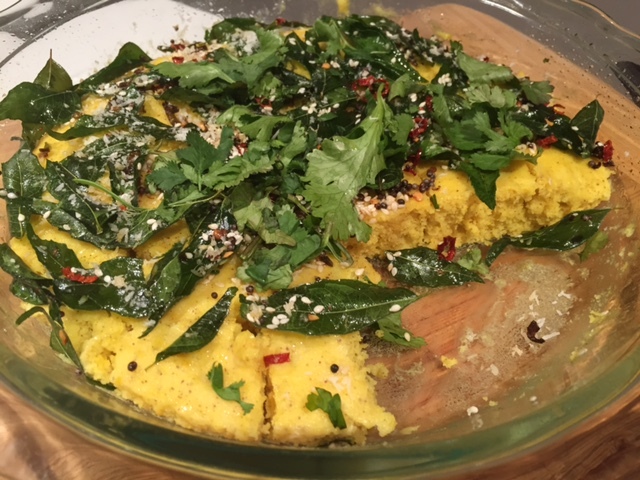 When my husband saw Rick Stein’s recipe for dhokla he spoke of strong childhood memories of his mum’s irresistible dhokla. My mother-in-law comes from Gujarat, a vegetarian state, and when you taste her homemade Indian delights any cravings for meat or fish disappear. So of course we were both keen to replicate one of her most loved dishes. Dhokla is a savoury spongy cake-like bread that can be enjoyed for breakfast, as a snack or as part of an Indian lunch or dinner feast. Rick Stein’s recipe, with a topping of prawns, is pretty elaborate but my husband assures me that the vegetarian (and less costly) version you see here is as about as authentic as it gets. Adapted from Rick Stein’s India (prawns and sugar removed, vegetable oil replaced with coconut oil or ghee). Combine the flour, water, baking powder and yoghurt in a bowl and allow to sit for one hour. 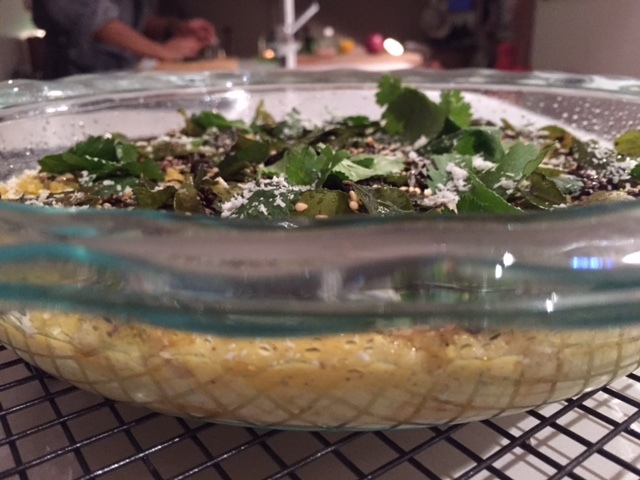 Then mix in the remaining dhokla ingredients (excluding the topping ingredients). Grease a cake tin (around 18cm in diameter) and then pour the dhokla mixture into the tin. Cook in a steamer, covered, for 15-20 minutes, or until the dhokla is firm and cooked right through. Put the dhokla to one side covered with a damp cloth. For the topping heat the oil in a saucepan on a medium heat. Add the mustard seeds and allow them to pop and then throw in the curry leaves, chilli powder and green chilli. Fry for a minute or so, then add the sesame seeds and cook for another 30 seconds. Turn off the heat and spoon the topping over the steamed dhokla. 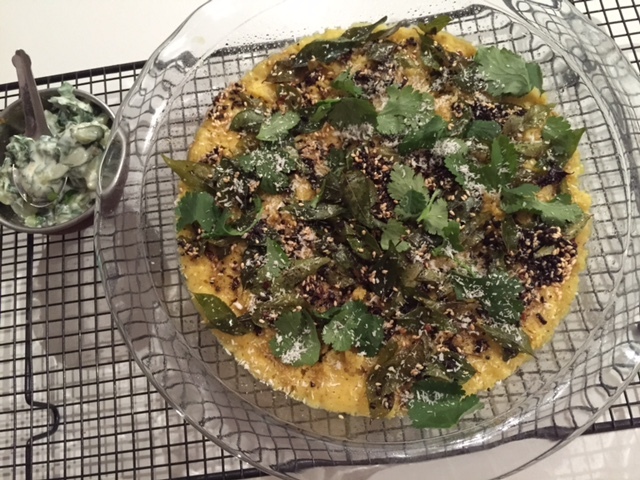 To serve remove the dhokla from the tin and sprinkle over the coconut and coriander. The resting time in step 1 is essential – don’t neglect to wait one hour at this point. Experiment and add a little extra baking powder to get a really airy and light end texture. 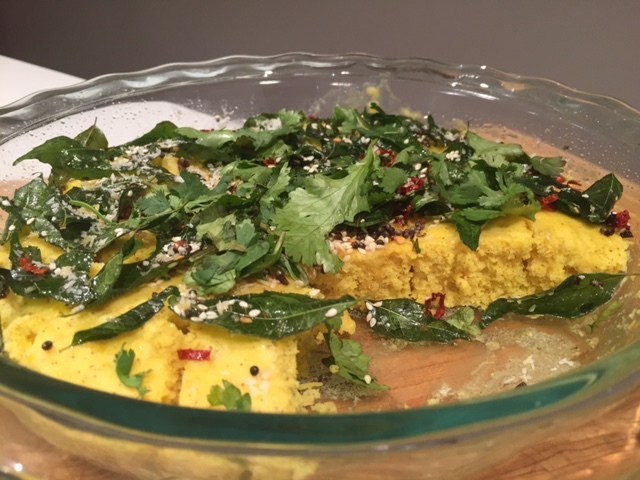 Cut the dhokla into slices or 5cm squares – but keep it formed as a whole and serve individual pieces. If you’d like a little sweetness then add 1 tsp sugar at step 2. 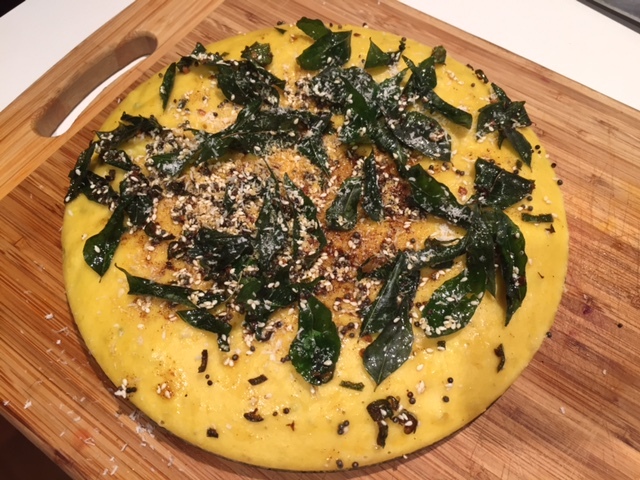 Tags: curry leaves, dhokla, Indian, recipe. Bookmark the permalink. what a delish dish! I love corriander. Thanks yes the coriander, curry leaves and coconut topping add so much flavour! 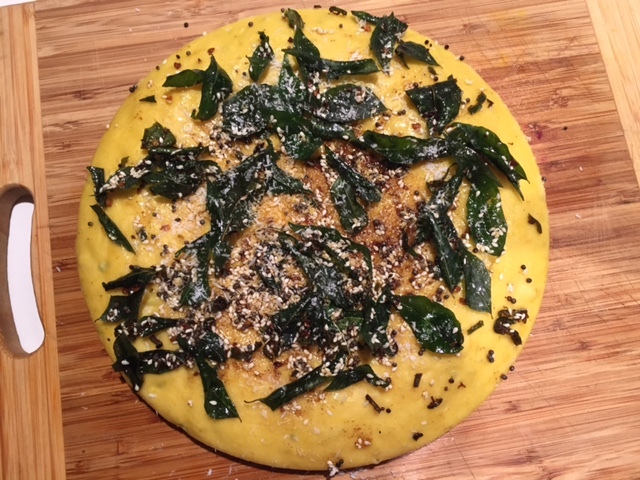 Hi Nandini you must try dhokla – it’s so easy! Thanks! And yes it’s always as good when you go in for seconds and thirds!